Dr Grahaeme Henderson recently gave a distinguished lecture at the University. 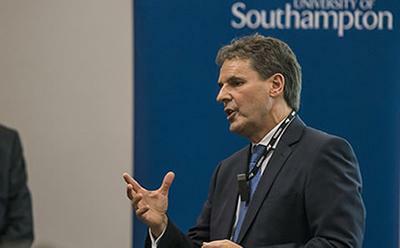 The University has announced the appointment of Dr Grahaeme Henderson, Vice President, Shipping & Maritime at Shell, as Adjunct Professor with the Southampton Marine and Maritime Institute (SMMI). Through his appointment, Dr Henderson will work with the Institute to provide students, academic and professional colleagues with operational insights into innovation, entrepreneurship and management within the global marine and maritime industries. Based at the University’s newly-opened Boldrewood Innovation Campus, the SMMI is the largest single entity of its kind in the world which encompasses over 300 academics and integrates all marine and maritime disciplines across the University. Dr Henderson is responsible for Shell’s international shipping and maritime activities. His global team manages Shell’s oil tanker and LNG vessel portfolio including over 40 LNG carriers. This is one of the world’s largest LNG fleets and includes some of the world’s most technically advanced LNG carriers. He is strongly focused on driving improvements to safety and the environment across the industry, improving the efficiency of shipping and maritime operations through technology and innovation- all areas compatible with the research and enterprise activities of the SMMI and the University. Dr Henderson is very active in a variety of shipping industry bodies: Chairman of Oil Companies International Marine Forum, Vice President of the UK Chamber of Shipping and Chairman of UK Shipping Defence Advisory Committee. He is also a member of the World Economic Forum’s Global Agenda Council on the Oceans. He has been a member of the Shell Trading Executive Committee and a Director of Shell International Trading and Shipping Company since April 2011. He was previously Managing Director of Brunei Shell Petroleum, Royal Dutch Shell’s upstream joint venture company in Brunei. His career with Shell has also included assignments in the UK, Nigeria, Syria and The Netherlands.